The Steelers needed big plays by their best wide out Sunday night to wrap up their first AFC North Title since 2010, but in the end, they got the job done to top the Bengals 27-17. The win ends the Steelers regular season at 11-5, the first time they have ended the season with that record since 2005, a season that ended with a Super Bowl win over the Seattle Seahawks. Antonio Brown was the hero, taking back a punt 71 yards for a touchdown in the first quarter, and then ending the night with a 63-yard touchdown in the fourth quarter to make it a 10-point game. Brown became the first Steelers wide out in history to lead the NFL in receptions with 129 catches on the season. He also led the NFL in yards with 1,698. The Steelers didn’t come out of the game without a scary moment, as running back Le’Veon Bell went down with a hyperextended knee in the third quarter after a hit by Bengals safety Reggie Nelson. Bell jogged off the field but was in obvious pain as he was examined on the sideline. He eventually was taken to the locker room. The game was tied 10-10 when Ben Roethlisberger hit Martavis Bryant for a 21-yard score to put the Steelers up 17-10. They led it 20-10 at the half. Roethlisberger went 24-for-38 for 317 yards with two scores and a pick. The win means the Steelers will host the Ravens Saturday at 8:30pm at Heinz Field. 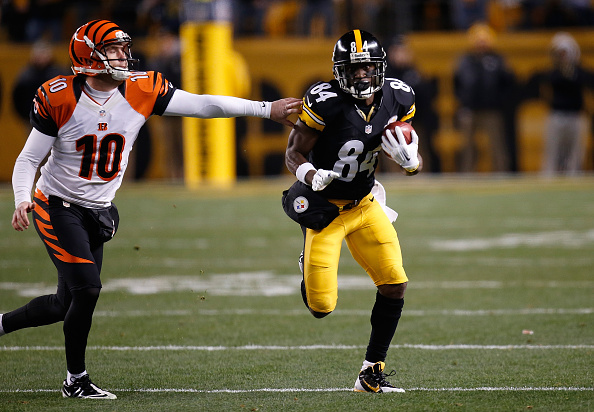 Be the first to comment on "Steelers Win AFC North, Top Bengals 27-17 to Move on to Host Ravens"